The first gen of Intel-powered smartphones didn't exactly make a big splash but, given the low standing of their manufacturers and the limited availability, that's hardly a surprise. Back then, it was all about slapping a logo and selling it on your networks. Things are pretty different with the Motorola RAZR i, which turned out to be a pretty stand-up droid. Motorola has done a great job of the hardware and used materials every flagship would be proud of. There's also the almost bezel-less design, which is the envy of the industry. The UI is nicely designed, that extra homescreen reserved for settings a real usability boost. Motorola has kept close to stock Android, only changing what they believe can be improved, and the result is quite good. 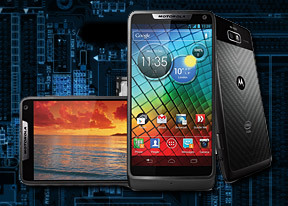 The great battery life should also boost Motorola RAZR i's market prospects. The smartphone's 2000 mAh battery lasts for ages and will easily make you forgive it not being user-replaceable. Finally, there's the commitment to delivering timely updates. Normally, we wouldn't be too quick to believe such a promise, but with Google backing them, Motorola are worth the benefit of the doubt. In fact, we'd be hugely surprised if the RAZR i doesn't get to taste Jelly Bean before the end of the year. So the Motorola RAZR i shapes up to be one of the most solid smartphones currently available in the midrange. However it's not an unbeatable offering and here are a few contenders that would gladly take on the challenge. The first name that springs to mind is the HTC One S. The beautifully slim smartphone offers a choice of ceramic or anodized aluminum for its finish, depending on the color you pick, and an equally big screen of the same type and resolution as the RAZR i. It also comes with a couple of Krait cores and an Adreno 225 GPU under the hood, which have the Intel Medfield beat at the benchmarks. Best of all, the One S cost less than the Motorola RAZR i. The catch? There's no microSD card slot here and some regions got a Snapdragon S3 powered-version instead of the S4 one. Once considered one of the best smartphones on the market, the Sony Xperia S is now standing firmly in midrange territory. Its dual-core chipset fails to match the Snapdragon S4 in terms of performance, but the 720p BRAVIA-powered screen easily puts the PenTile matrix of the RAZR i to shame. There's a 12 MP camera aboard the Xperia S too. Once again though, a card slot is omitted and the Sony Xperia S can hardly match the compact size of the RAZR i, but right now it costs noticeably less, so it's not an easy call between the two. Worst part is, the Motorola RAZR i's pricing at launch is far from competitive. In fact, it's dangerously close to some proper flagships. The HTC One X and the LG Optimus 4X HD are still about €40-€50 more expensive than the RAZR i, but even the die-hard Moto fans will tell you that the two have more than enough to justify such a difference. So if you aren't on a super tight budget, digging a bit deeper might be your best bet. So, the Motorola RAZR i is a bit overpriced at this point, but that's usually the case with smartphones that have only just arrived to the market. It might make sense to just wait a few weeks for its price to settle down or to shop around for carrier contracts. The good thing about a smartphone like the RAZR i is that it will eventually get cheaper but not show it.